Lightweight women’s double (LW2x) final race for Olympic Qualification, today, Poznan, Poland. Six remaining teams wanted the two Olympic spots. Perhaps the Netherlands wanted it the most. Kirsten van der Kolk of the Netherlands finished with bronze at Athens. 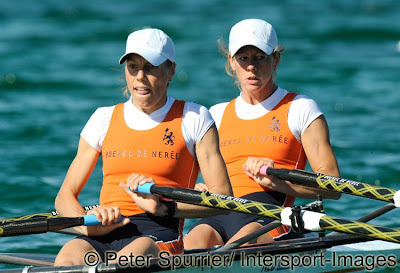 Van der Kolk then semi-retired from rowing, had a baby, named the baby Nike and came back to join her Athens partner Marit van Eupen late last year. They put gold shoes in their boat and started their comeback. Jumping out at the start, however, wasn’t the Dutch. It was Poland with Renee Hykel and Jennifer Goldsack of the United States following closely. This didn’t last long as the Dutch worked their way into the lead with a steady 35 stroke rate pace. In the last 500m it looked like only Goldsack and Hykel had enough to hold on to the Dutch leading pace. What could Poland do? At the line the Netherlands add another boat to their Olympic team and the United States add boat number 13 to their Olympic team. Congratulations Marit, Kirsten and their coach Josy.